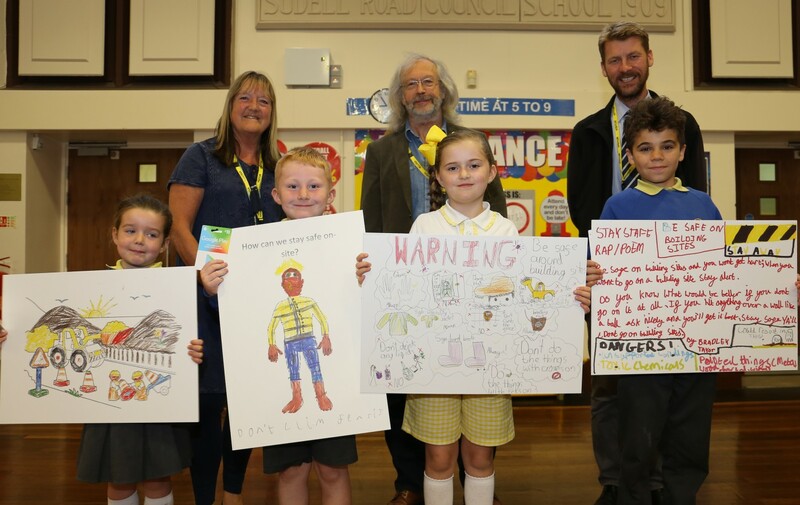 The pupils at Sudell Primary School took part in a poster competition to highlight how to be safe on construction sites and what to do and what not to do. The competition is linked to the upcoming Ellison Fold Way transport scheme, and Blackburn with Darwen Council is working with contractor Eric Wright Civil Engineering Limited to make sure local people are involved in the project. Eric Wright recently held a number of Health and Safety classroom sessions with Sudell Primary School, with the children entering a competition to produce posters with the theme of safety around construction sites. Blackburn with Darwen Council and Eric Wright chose four winners from across the school, from Reception to Year Five. The school children and their parents were invited to a special celebration assembly on where the winning entries were announced and each child was given a £10 book token. The winners were Evie Bolton, Kaleb Young, Madison Sweeney and Bradley Taylor. All the posters created by the children at Sudell primary School were fantastic, and I would like to congratulate the winners and everyone who took part for their brilliant work and their help in educating us all about safety on construction sites. Ellison Fold Way will see the construction of the 750 metre new road link between Marsh House Lane and Ivinson Road and a number of long-awaited junction improvements. As part of the scheme, the Council and Eric Wright have made the commitment to support the local supply chain, support careers education and information and commit to curriculum development in local schools and colleges.